Metallica are still searching for the "ultimate riff". The 'Nothing Else Matters' rockers, who are currently in the midst of travelling the world performing various gigs, are looking forward to releasing a follow-up record from 2008's 'Death Magnetic' and while they aim to outdo their previous albums, frontman James Hetfield admits they will "never" be pleased until they find the perfect sound. When asked where the fuel for their tenth album would come from, he replied: "The fuel will come from where it normally comes from: the will to do better, to do better than you've done before. "Still searching for the ultimate riff, the ultimate guitar sound, the ultimate lyric, all of that stuff. It's a never-ending quest, you know, never satisfied. So that, as well as just enjoying and taking care of the life we have. We're pretty blessed." 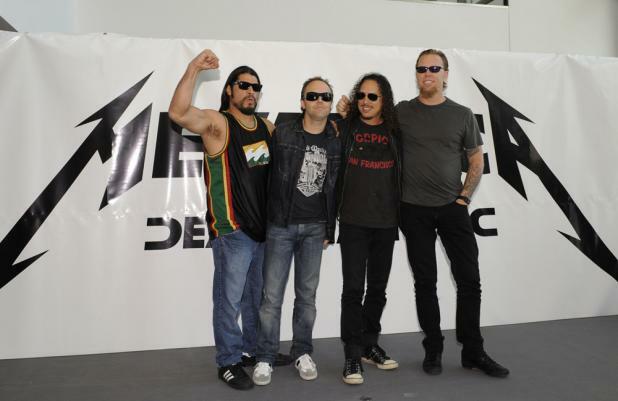 The quartet - also formed of Lars Ulrich, Kirk Hammett and Robert Trujillo - feel "blessed" to have played shows in such rural locations around the globe and hope to perform in more obscure places in the future, whether they'd be welcome there or not. James added to South African music programme MK Ondergrond: "We're blessed to be able to go places that, I mean, half the world doesn't get to go to, or even more. Bands out there that are still stuck in a local scene, you know, we've got to see the world, you know, and this is a big part of the world. "They're still places for us to go. We don't know where yet but I think China and, you know, a few other - Iran would be nice. Some places that don't want us or hate us we'd love to go there and play." Chart-topping metal behemoths on a world wide tour following the release of their latest album Hardwired…To Self-Destruct.